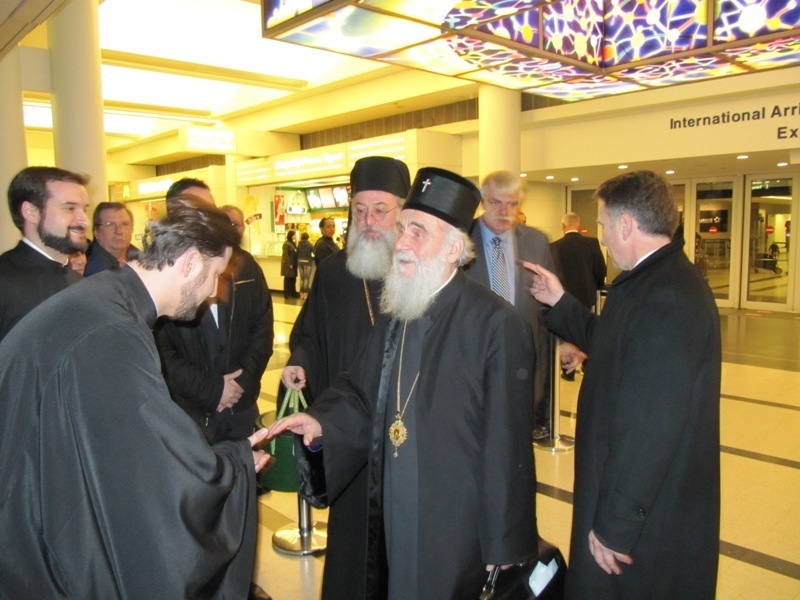 Chicago, IL - On Wednesday, February 16, 2011, His Holiness IRINEJ, Serbian Patriarch, arrived in Chicago in the evening hours. His Holiness was met by His Grace Bishop Longin of New Gracanica and Midwestern America, Consul General Desko Nikitovic of the Consulate of the Republic of Serbia in Chicago, members of the clergy of the Metropolitanate of Libertyville and Chicago and the Diocese of New Gracanica and Midwestern America and the Sisterhood of the Nativity of the Mother of God Stavropigial Monastery in New Carlisle, Indiana. Upon arrival at O’Hare International Airport, His Holiness traveled to Holy Resurrection Serbian Orthodox Cathedral in Chicago, Illinois, where a Doxology (Service of Thanksgiving) was served in honor of the arrival of the Patriarch. His Grace Bishop Peter of Cleveland (Russian Orthodox Church Abroad) also met the Patriarch at the Cathedral. After the Doxology, His Grace Bishop Longin welcomed His Holiness to Chicago and asked that the Patriarch bestow his Patriarchal blessing upon the Christ-loving Serbian Orthodox Faithful of Chicagoland and the entire territory of the Diocese of New Gracanica and Midwestern America. In response to Bishop Longin’s greeting, His Holiness thanked Bishop Longin and the clergy of the Cathedral and the Diocese for their warm welcome. His Holiness spoke of his joy in visiting Chicago, the need for continued unity in the homeland and Diaspora, as well as the importance for the Serbian Orthodox Faithful outside of Serbia to hold on to its roots and faith, because our faith is the most important part of our existence. Following the Patriarch’s message, those in attendance proceeded to the hall for a small reception in honor of the Patriarch’s arrival.